10/25/10 "It Ain't Easy Getting Around New York"
While thinking for today's comic I came to a realization. If I am in New York, surely the rest of the gang is. 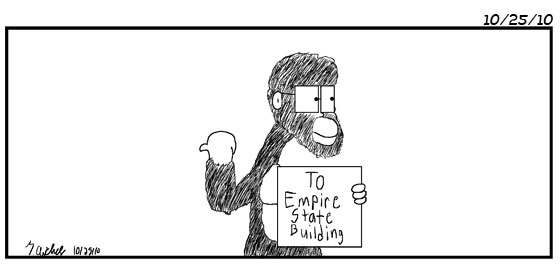 Therefore, why are there not comics of Cartoony Tim Running amok in New York? Hopefully I can think of more shenanigans for Cartoony to get into while in New York. "Start spreading the news. I'm leaving today. I want to be a part of it. New York, New York."